Numbers of large storms moved across northern California in January after a modest early winter. Snow piled up deeply at Sierra Nevada resorts. As a decades old, advanced resort snow skier, my primary interest during the period was skiing while keeping tab on amounts of precipitation in our southern desert wildflower areas. Generally these early storms did not provide much to desert areas. Snow piled up to such depths that SR88 to my season pass resort, Kirkwood, was often closed at infamous Carson Spur due to avalanche dangers. Accordingly on January 21 and 24 I visited the small Dodge Ridge Central Sierra Nevada resort along SR108 east of Sonora on a couple of exceptional fresh powder days. On the first visit, 23 inches of exceptionally light snow had fallen over night and 66 inches over 48 hours resulting in a wonderfully deep down in snow experience. The second visit 3 days later was just on 24 inches overnight. 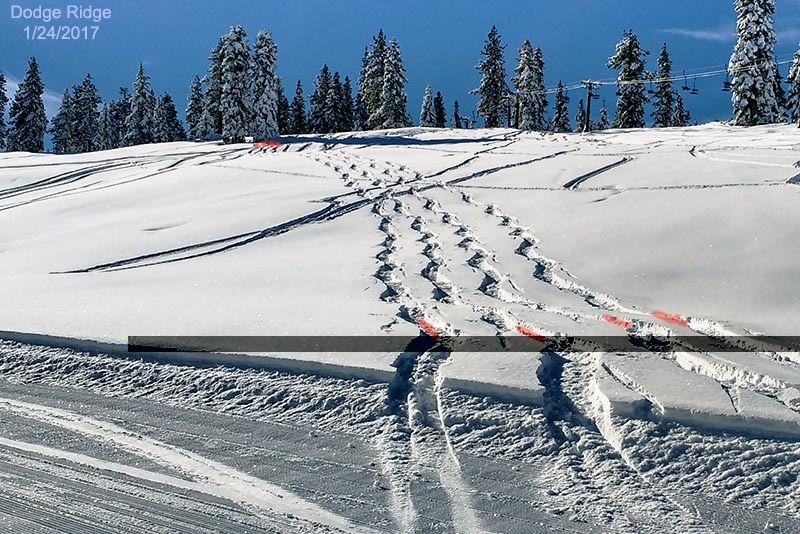 Like a compulsive dog lifting its leg to pi$$ on a fire hydrant, the above image taken with my moto g shows my 4 side by side leisurely bouncing S turn powder tracks early morning on a novice slope right at the resort base as I waited for more advanced chairs to start running. 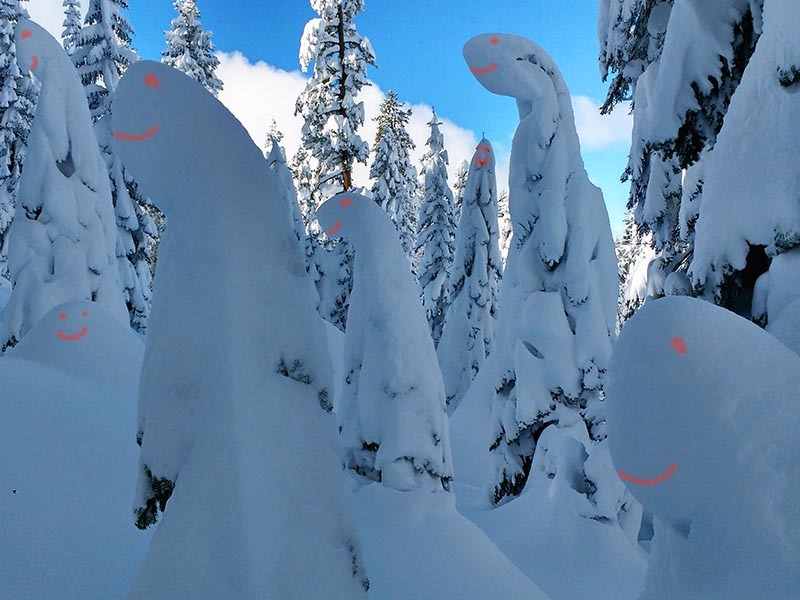 This next image also with the moto g shows snow buried small fir trees I've added a bit of comical additions to. 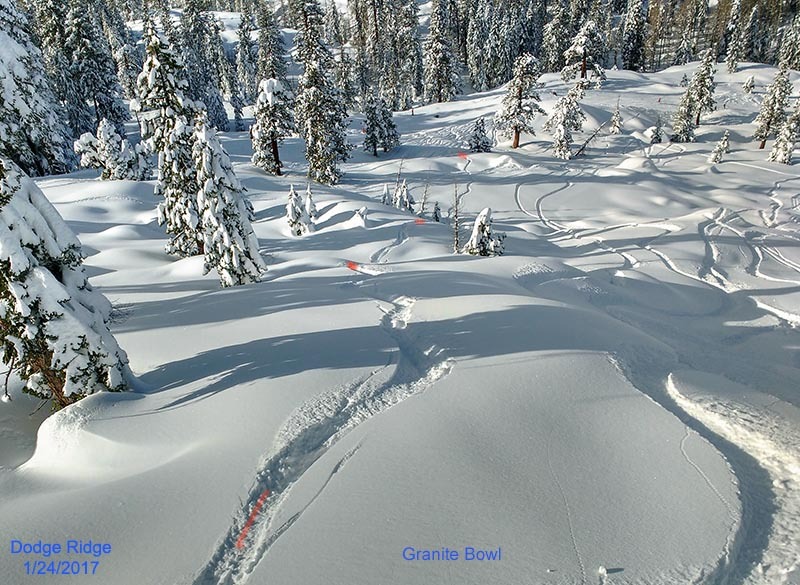 And this third image above taken while riding up Chair 8, shows what such a winter wonderland within 12 foot deep snows look like with my playful bouncing track down into Granite Bowl. Words cannot adequately describe to those unfamiliar what the above feels like beyond a vague term like dreamlike and ethereally soft. February 2, 2017 visited Forest of the Nisene Marks State Park that is near Aptos, California in Santa Cruz County within a second growth redwood forest. Redwood forest are good choices for a photographer to visit on a rainy day with diffuse light. 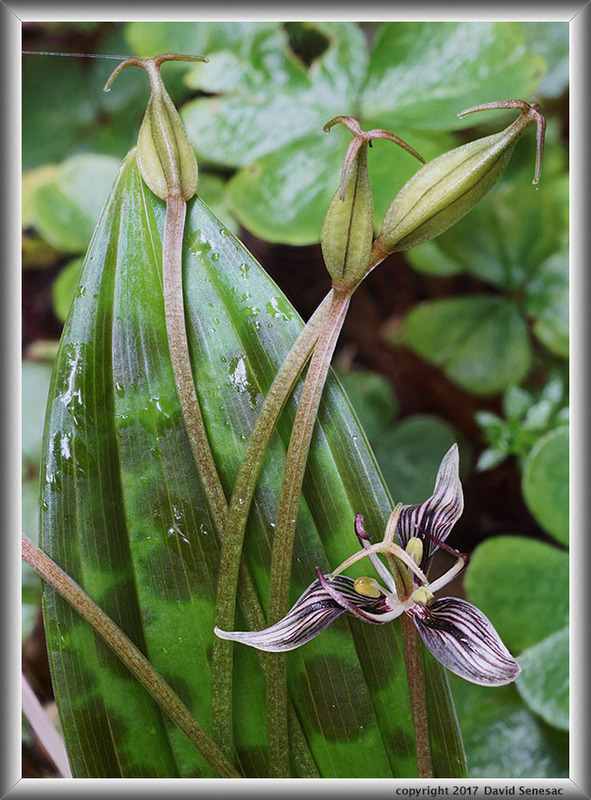 My interest this day was not the forest but rather one of the region's most interesting looking wildflower species fetid adder's-tongue, scoliopus bigelovii. The above image shows a bloom of one plant with the aesthetic mottled leaf just behind and 3 gone to seed flowers sticking up above. This next image above shows a rain wet fallen box elder branch with turkey tail, trametes versicolor, fungi, lichen, moss, and a fetid adder's-tongue, scoliopus bigeloviileaf. With the arch of my right foot sole oddly sore from skiing, I spent some time locally hiking. Thus on a sunny breezy day went on a day hiking a trip on a Saturday to Harvey Baer Ranch County Park east of Morgan Hill. Trails were horribly muddy from hoof prints of the abundant massive heavy cattle allowed to graze the park even when soils are very soft from rains. On Sunday visited an old favorite Pacheco State Park just to check rising wildflower conditions. It was a rather productive day including exploring some unfamiliar areas of adjacent San Luis Wildlife Refuge. Then a couple weeks later returned on a longer hike. I needed to thoroughly check out my camera before the coming desert road trips so took a few modest images. Conditions were soggy with trails often muddy. 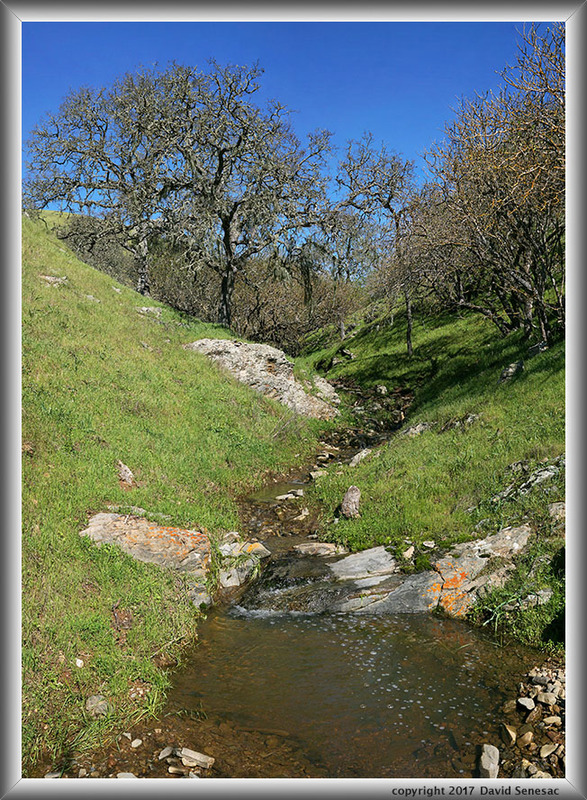 The above image shows a blue oak stream ravine on the west side of the park. A week later on a pleasant sunny day I was back up skiing over a couple days at Kirkwood Ski Resort. 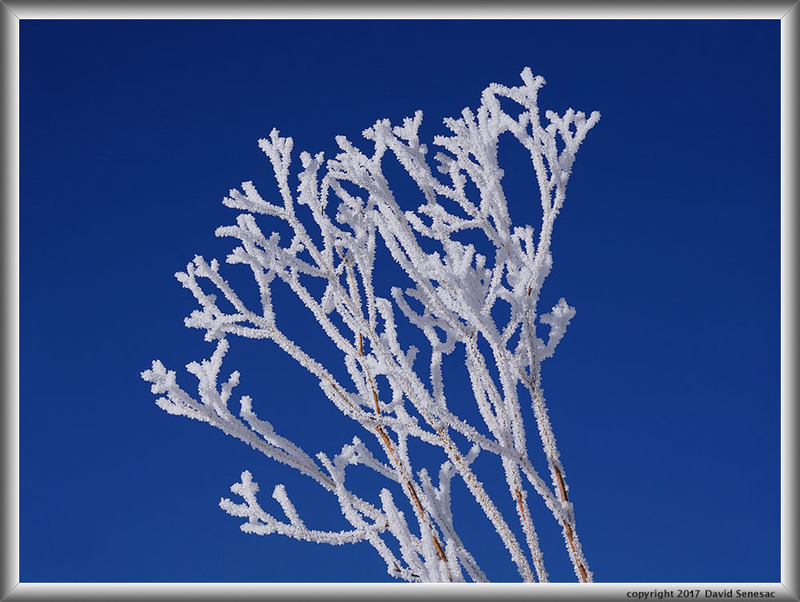 On Sunday morning spent an hour shooting snow subjects along the Carson River including the rimed bare dormant branches of a yellow willow up against blue sky at page top. 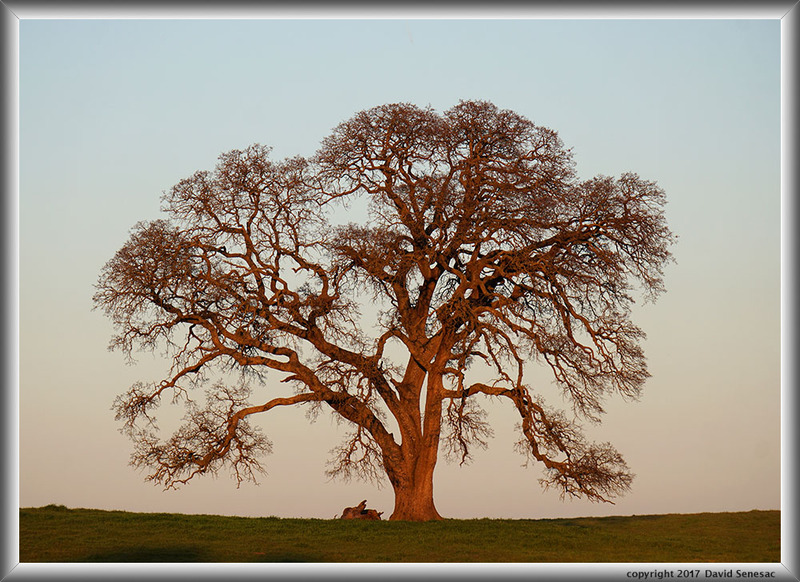 On the way home stopped road side along a barbed wire fence in a cattle ranching zone to capture the above telephoto using my Sony SEL55-210 lens of a valley oak in sunset light. The end of February marked an important milestone in my life. On February 16 I received an exit interview from the telecom business phone systems corporation I had been working for over the past 8 years. 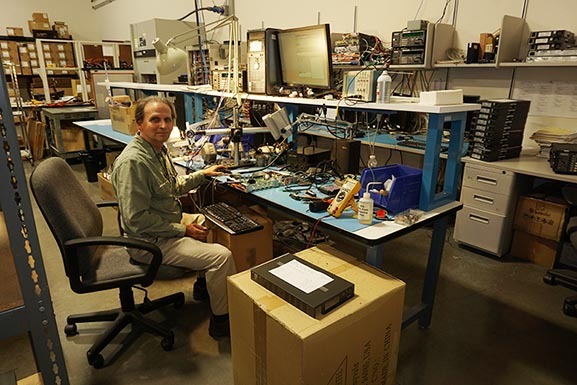 After 4 plus decades working in Santa Clara County, Silicon Valley, my electronics career primarily as an electronic circuit troubleshooting expert was ending as I began retirement. Just after that I applied for benefits and Medicare on the Social Security Administration site. Thus a new era in my life is beginning with every day waking up a Saturday. A key reason for doing so at this time was to be free as a photographer, given this winter's epic rains, to work wildflower landscapes this spring in our Southern California desert areas. A situation I was quite familiar with as prior to starting this currently ending job, I had been similarly free for 6 years after ending 5 years working for Cisco in their mid-range router engineering business unit and had previously taken off several months to a couple years between other employment over the decades.